Instant Imprints San Antonio, TX | Custom T-Shirts, Embroidery, Signs and More! 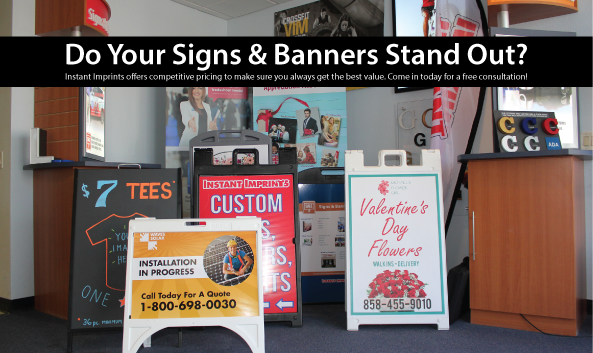 At Instant Imprints San Antonio, our customers come to us when they want to be more visible to their customers. We create that visibility five different ways: Branded Apparel (embroidery), Signs & Banners, Promotional Products, Custom T-Shirts and Print Services. Laura did a great job & has very reasonable prices! Are you looking to promote an event, sports team or business in a big way? Then look no further that Instant Imprints in San Antonio! Our custom t-shirts, printing services, promotional products, custom banners and branded embroidery items can help you stand out in style, and give your brand visibility a serious boost. At Instant Imprints, we pride ourself in getting your job done right the first time. That means our local Image Experts work to understand the needs of your project and answer any questions you may have. Stop by our showroom today to check out the promotional possibilities! Next time you’re in need of promotional goods in San Antonio, just ask your smartphone, “Where’s the best print shop near me?” and you’ll be sure to find Instant Imprints! We bring together the exceptional quality of an industry leader and the local touch of a San Antonio Image Expert, to give your project the power to grow to its full potential. Since promotional goods are often your prospect’s first impression of your brand, it’s critical to use the best print shop around! All across Texas, businesses know the promotional power of custom t-shirts. They’re a great way to give your logo legs, as your brand visual is presented across town and beyond. Custom tees are great in giveaways, or you can offer them for sale so that your loyal fans can show their support. With a variety of screen printing processes available, our Image Experts can help you pick the perfect processes for your project. When brands in Texas want to stand tall, they utilize custom banners and signs. These are a tried-and-true method of getting the word out in a way that can reach prospective customers, no matter where they are. Our roll-out banners make your promotion portable, and our professional trade show displays can help you make a big impact at your next event. Have questions about what banner design is best for you? Our San Antonio Image Experts are happy to help! At Instant Imprints, we provide brands with the tools they need to take their visibility to the next level. When you’re ready to start your new promotional journey, stop by our showroom on Bandera Rd, give us a call at (210) 256-0000 or request a quote online today!